Sign in one of the elevators of our apartment building. 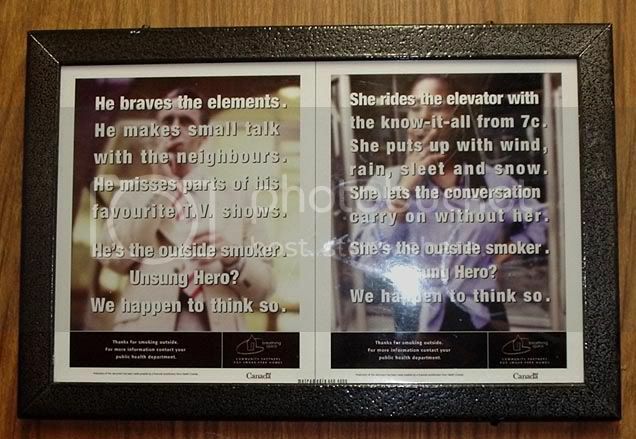 I really disagree with the notion that what they describe in these pictures is heroism, unsung or not. Seriously, since when is a mind-numbing addiction an accomplishment? I could make a far stronger case that people like this are victims than they are heroes. And for the record, I’m not saying that all smokers are mind-numbed addicts, just the ones who do what is described in the above; my mother has been smoking most of my life, though she managed to keep it away from me at a younger age, and will still refrain from doing so in a good number of situations(unless something’s really changed since last I was there). Personally, I think that makes her just a bit more of a hero than the above; she’s not enslaved by smoking, smoking does not dictate what she does or does not do; she FIGHTS whatever addiction and temptation that smoking throws her way. She controls it more than it controls her. Took her a bit of doing, but at least it’s been done. I dunno, not to go on about her, but I just think the term “hero” is thrown around a bit too loosely these days. Perhaps not the most shining example in my argument, but I think it still fits. I don’t really know what I’m getting at, just wanted to get that bit off my chest, since that sign’s been bugging me for weeks now.